It was my turn to pick the recipe for Food Network Friday this time. It seems like ages ago now, because we’ve had a break for MoFo. 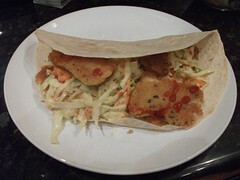 I wanted to try my hand at something fishy so I scoured the Food Network website for something likely. When I spotted this recipe from Emeril, I remembered the big jar of fresh grated horseradish in my fridge and I knew I was going for it. It wasn’t really very difficult to veganise apart from the fish. I decided to use tofu. I pressed it then marinated it overnight in soy sauce, caper juice and kelp, for extra fishiness. Then I used Emeril’s beer batter but added some very finely chopped toasted nori into the flour. For the coleslaw I just swapped vegan mayo and sour cream for their dairy counterparts. I was eating on my own yet I still made half of the dish which was supposed to serve 4. (The photo above was not even half of what I ate). I loved this so much I ate and ate until I felt sick. I love horseradish and it gave a really good kick to the coleslaw, which worked really well with the crunchy beer batter. I don’t think my version really tasted of fish but the marinade and the nori certainly gave it a flavour of the sea. I’ve still got quite a bit of the essence left over if anyone has a recommendation for it. 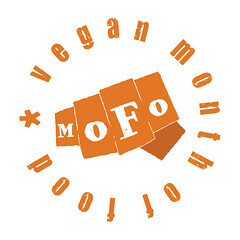 This entry was posted in Food Network Friday, Veganmofo 2010 and tagged Veganmofo 2010 by efcliz. Bookmark the permalink. Looks Great! I am excited to give it a try.